Viaggia in campagna come fanno gli olandesi - in bici. 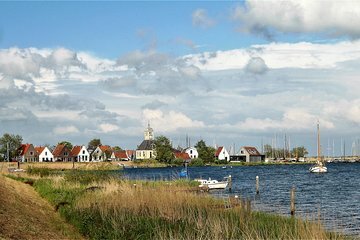 Unisciti a questo tour in bici per piccoli gruppi attraverso il bellissimo paesaggio dei polder, recuperato dal mare, che si trova a nord di Amsterdam. Pedalate in 3 villaggi pittoreschi e godetevi le foto mentre vagate per le città. Sali su una torre della chiesa vecchia di 400 anni e goditi la vista spettacolare. The bike tour was the highlight of our four days in Amsterdam. The guide was very knowledgeable and attentive. Both of us are in our seventies and in pretty good shape. We picked Sunday morning for the tour. Best time. Minimal bike and auto traffic. We only had four ridders which made this a great day. Get out of downtown and see the beautiful countryside and history about how it was created and water managed.